Same issue with coupler but saw one side had wider gap than the other. Put in vice and used flat head screw driver to bend open the more closed end...slid right on the bars. Just put these on my 2009 DL650 yesterday. Mostly the install went fine - similar problems to what others encountered. I had to use a 12" lever on the OEM bolts for removal - and still have to stand on them with almost all my body weight to break the thread-locker. The Motech bars were straightforward to install. I used thread locker, but also found that the supplied bolts are soft - getting them anywhere near the specified torque started to round out the bolts (and my allen wrench head was in perfect condition and good materials). I also had issues with the connector (that secures the 2 bars to each other) being difficult. One side accepted the crash bar pipe easily, the other side didn't. Took a fair amount of prying to spread it wide enough for both bars, and even then it torqued the 2nd bar so that the bolt holes didn't line up perfectly. But with a little prying, they lined up. Once in place - it all seemed snug and solid. Took it for a test ride today around town (nothing about 40mph), and didn't notice any vibration. Happy purchase. The torque spec in the manual is wrong. It should be 16.5lb-ft, not 25.5lb-ft. Additionally, liquid thread locker acts as a lubricant and the torque should be reduced from a dry spec. anyone any idea where I can get the mounting hardware for a gen 1 SW Motech crash bar? I bought them on ebay without the hardware (needs that long through bolt and spacers etc). Twisted throttle said they could not supply just the hardware. Any ideas. Blindly purchased a set of SWM crash bars without realizing they were obsolete. So any ideas on what bolts (size, etc) are needed? Or should I just bin them and spend for modern crash bars? 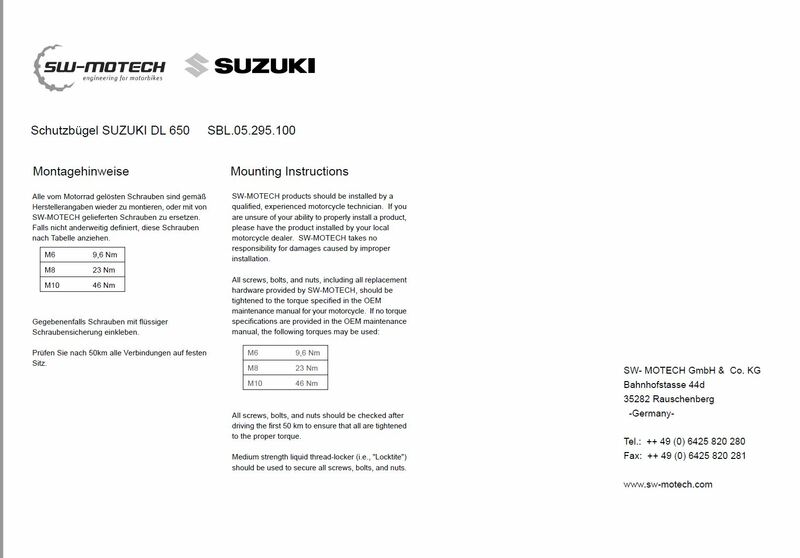 Not sure if you have a Wee (DL650) or a Vee (DL1000), but here are the instructions for a Gen 1 DL650 with bolt info. If you need the Gen 2, holler. Last edited by Stalky Tracker; 02-10-2019 at 04:19 PM. 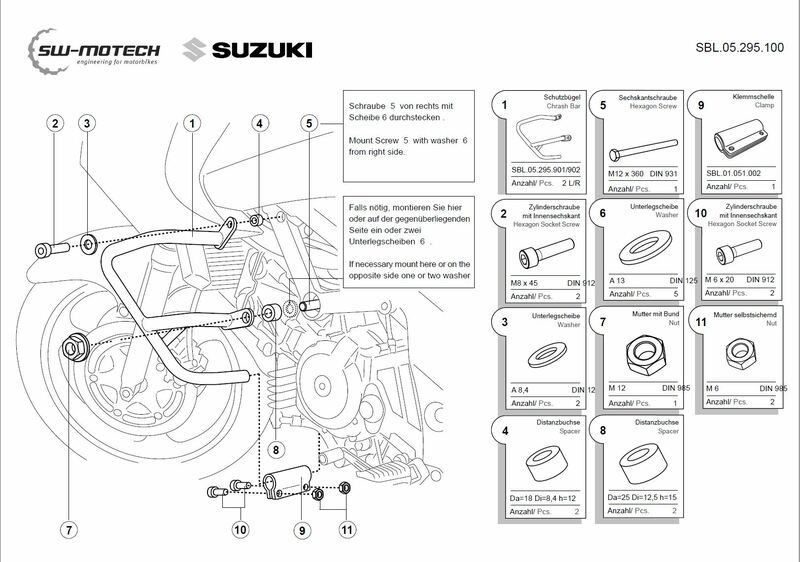 Looking at the number of bolts used to fix the bars to the bike is the easiest way to pick the two apart. If you have the newer bars then getting some new hardware shouldn't be too difficult. (aside from the stand offs, but if you can find a suitable bar you can cut your own pieces as the specs are in the instructions) If you have the older bars then the long through bolt might be more difficult to source. You could perhaps just use some threaded rod, but I am not 100% certain. Either way getting new fixing hardware shouldn't cost you too much. Alternatively @FatherX have you tried contacting SW-Motec directly, they might be able to help you out.